The Centre for Climate and Sustainability (CCS) works at the cutting edge of RE policy and implementation, covering major areas of research such as climate energy scenarios, future energy security issues, accelerated deployment of RE technologies through RE action plans and policy support, and enhancement of complex decision-making capabilities at institutional levels. The Centre has developed an integrated vision spanning climate policy and energy security issues, combining expertise in energy economics and technologies with sustainability of development. Long-term research into pricing and externalities in the power sector for creating a level-playing field for renewable-based power generation. Resource assessment of conventional and non-conventional fuels to analyse their future potential. Generate policy alternatives and scenarios that will integrate renewable energy and sustainable development into a broader societal policy, in the emergent context of global climate change imperatives. Undertaking in-depth and analytical studies for the Government of India on RE technologies and climate change. Conducting futuristic studies of energy scenarios for ensuring an energy secure future. 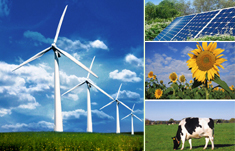 Vision 2020: integrating renewable energy with all sectors of development. Organizing and conducting seminars / conferences pertaining to energy policy and sustainability issues. Documenting and propagating international best practices for mainstreaming renewable energy in India.